I watched TV on Saturday evening. This could mean only one of two things. Saturday was National Day and the parade was on. Or the Internet was down. Despite that one neighbour who is still displaying the Singapore flag, I believe we’re way past Aug 9. Which means the reason I turned on my 32-inch Samsung for the first time in months was the Internet. Or rather, the lack of it. When I first lost the connection on Saturday morning, I thought something was wrong with my computer. So I turned off and on my computer because that’s what they always tell you to do when you call tech support. When that didn’t work, I turned off and on my router. When that didn’t work, I checked Twitter on my phone using mobile data. That was when I found out that the Singtel fibre broadband was down. So the only way to find out that you have no Internet is on the Internet. “It is baffling how customers were not informed through an SMS and/or an automated call that Singtel was experiencing a massive outage. Hey, that was what happened to me. Had I known it was a problem with the broadband itself, I wouldn’t have wasted my time turning off and on my devices like a chump. To make up for the outage, Singtel advised “affected customers who are also Singtel postpaid mobile subscribers to use their Singtel mobile broadband in the meantime” and said it would waive their Singtel mobile data charges for Saturday. This led to another uproar as not all Singtel broadband customers are Singtel mobile customers. Since I am a Singtel mobile subscriber, I took advantage of the waiver and used my mobile data on Saturday like there was no tomorrow. Huh? But I thought charges would be waived! There is a tomorrow after all. Oh no, do I have to sell my first-born on Carousell to pay my next Singtel bill? I panicked. Which should I believe, the Singtel SMS or the Singtel Facebook post? “I can’t seem to trust Singtel saying free data today cos the counter keeps increasing. With the limited Net access, you would think that people would have better things to do online than commenting on Singtel’s Facebook page and changing news headlines. 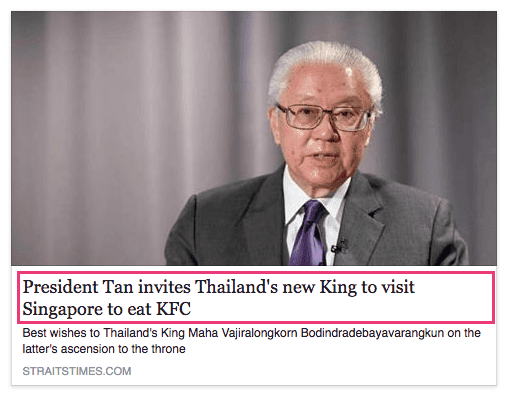 On Saturday, The Straits Times (ST) alerted its readers to a Facebook post where “an ST article with the headline ‘President Tan conveys best wishes to Thailand’s new King, invites him to visit Singapore’ had been modified”. It added that it viewed “this act of mischief seriously and will not hesitate to take action against those involved”. It didn’t say how the headline was modified. So I wasted precious data to find out that someone had added the words “to eat KFC” at the end of the headline. Apparently, some people actually believed the amended headline was written by ST. So far, KFC has not commented on this. Maybe it couldn’t because it uses Singtel fibre broadband. But Singtel said fibre broadband were fully restored as of 8.25am yesterday. I wouldn’t be surprised if the problem was found to be caused by a rogue train. The telco also offered its broadband subscribers a 10 per cent discount for this month and will waive local mobile data charges for both Saturday and yesterday for its post-paid mobile customers. But it can’t give me back my Saturday evening which I wasted on watching Mirror Mirror starring Julia Roberts on Channel 5. That’s two hours of my life gone forever. A book! Not even a Kindle. Next thing you know, we could be talking to each other face to face. I am not a regular TNP reader and this is the first time I have read an article by you. You did a great job in filling the vacuum left by SPH/Straits Times, Media Corp and the rest of the official media as far as communications in times of crisis is involved. Even SingTel failed. Its 1688 call line was taken over by a computer programmed to tell callers to call back another day as everyone was too busy already. At ChannelNewsAsia it was business as usual .ie more interested in problems in Jakarta, KL and Myanmar. You raised very valid points like since when has Facebook become the main channel used to keep Singaporeans informed? When i finally got through to a human voice after hanging on to the ohone for almost half an hour of repeated apology for keeping me waiting i asked why did SingTel not put out any announcement i was told it was on Facebook! I told her SingTel should play around with Facebook since not every Singapore is addicted to FB and suggested she feed back my comment to her CEO who may not be aware! It was this 1688 responder who out of the blue told me the secret how to get to the internet using my iPad with Sim card and that data charge would be waived. When i asked who would ensure there would be no charge she said it was programmed so now i wonder how come you got the notice you had exceeded your monthly quota? Looks like SingTel needs a complete shake up and put through a lie detector test! I hope the "relevant authority" to which SingTel wii report on the cause of the outage and subsequent action taken. But we will not be told but instead our fibre broadband charge will get a 10 % discount -- in my case $5.60 ! I will write to SingTel CEO to keep the $5.60 and instead let me know what really went wrong.